IDEAL FOR FIRST TIME BUYERS OR INVESTORS! Brookbanks are delighted to be offering to the market this one bedroom Victorian conversion, located on the top floor. This property has recently been refurbished throughout and is ready to move in. The property also benefits from great transport links as it is within a short walk to Plumstead Railway Station and excellent bus link into London and Kent. Other benefits include gas central heating and double glazing throughout. Call our sales team on 01322666452 to organize a viewing of this property. Brookbanks are delighted to be offering to the market this one bedroom Victorian conversion located on the top floor. 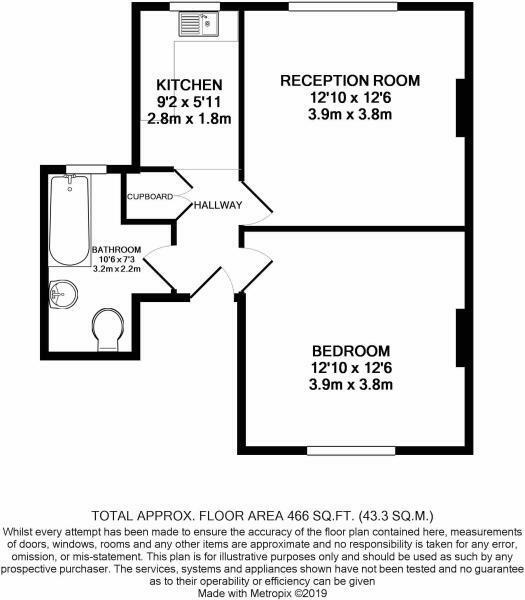 This property has recently been refurbished throughout and is ready to move in. The property also benefits from great transport links as it is within a short walk to Plumstead Railway Station and excellent bus link into London and Kent. Other benefits include gas central heating and double glazing throughout. Call our sales team on 01322666452 to organize a viewing of this property. Hardwood entrance door. Carpet. Built in storage cupboard. Double glazed window to rear. Carpet. Double radiator. Double glazed window to front. Carpet. Double radiator. Double glazed window to front. Laminate wood flooring. Double radiator. Wall mounted boiler. Single drainer sink unit. Range of wall and base units. Plumbing for washing machine. Tiles splash back. Built in oven hob and extractor fan. Frosted window to front. Laminate wood flooring. Low level w/c. Pedestal hand wash basin. Panel bath with shower attachment and mixer tap. Double radiator.